Grab those leftover vegetables from the fridge . 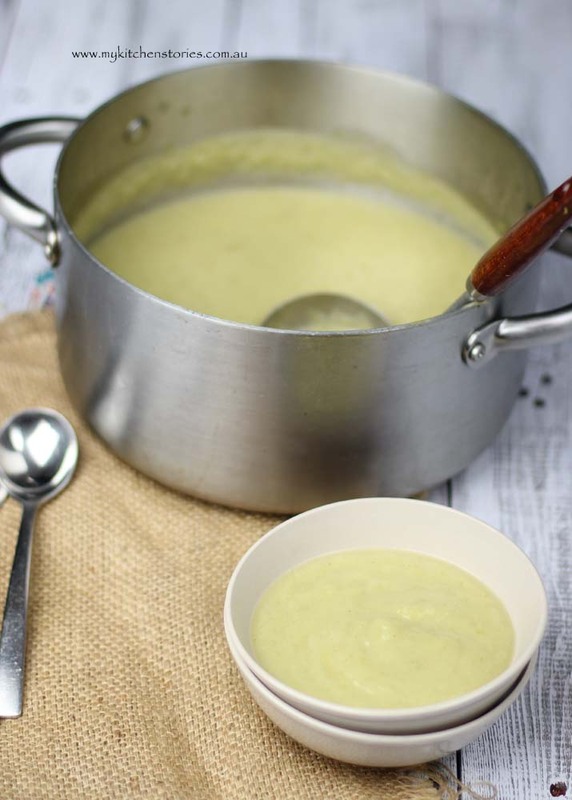 How to make soup from left over vegetables. I made this soup with left over celery. It’s a delicious soup all by itself. 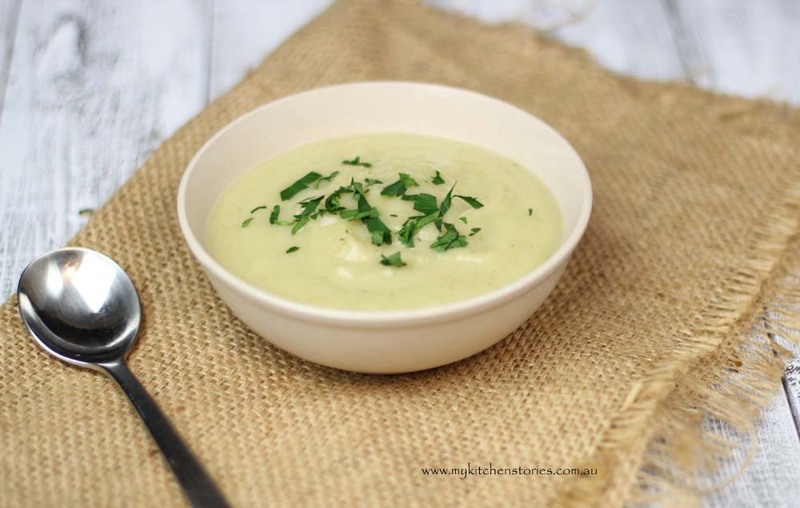 It’s really very simple and this recipe could also be used to make other flavours of delicious soup with the little bits of vegetables in the crisper. I always seem to have at least half a bunch of limp celery at any time. We just can’t seem to use a whole lot of celery and then I am very upset if I have to throw it out. Do you struggle with using up celery? 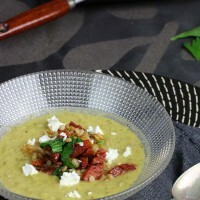 So to solve the celery issue whenever I can I make this soup. It really only takes about 30 minutes or so and that is usually from start to steaming bowl of feeling good finish. Don’t you just love to use up everything you can? Of course you do, and that is precisely why I suggest you can use this recipe to make soup out of other left overs. It could be carrots or potatoes. Say you had sweet potatoes going soggy at the corners in your fridge, fennel is a great one too. Sometimes I have half a fennel that has been shaved for salad and is left longing for a new life’s work. Now what if I told you with a couple of simple additions you could turn this into a stunning dish you would be proud to serve family or friends?. Well, its true. It’s an even better idea if you consider you can make it whenever you like and then reheat and add the accompaniments when it’s time. This. makes. life. easy. It looks like this, all dressed up at its tasty best. 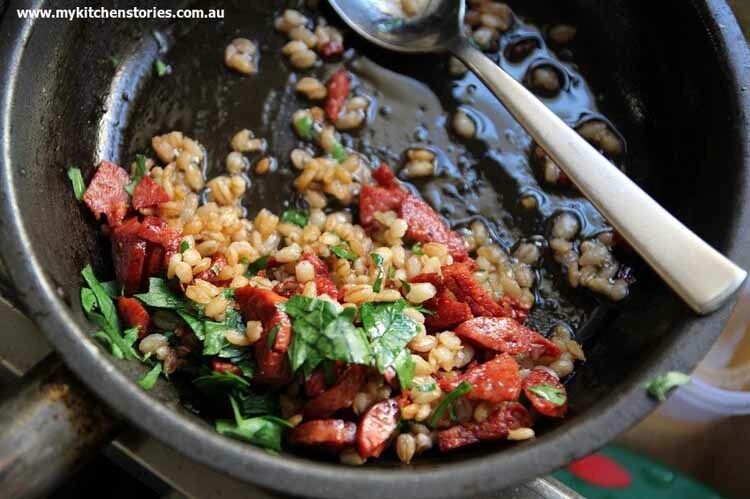 There are bits of Chorizo and feta and some crunchy barley bits as well as herbs. You can keep it vegetarian if you like and skip the chorizo, but no matter what vegetable you use or what you use to give it that extra kick, textures, bursts of herbs and salty cheese will make it all better. The secret is to making good soup is to not be tempted to add too much liquid making it watery and thin. Follow the instructions adding only a smiggen extra if you are using lots of potato type starchy vegetables. Remember you can always add more at the end and thin if required. Pretty isn’t it? With every bit you get more flavour. The melting cheese the crispy sausage and the chewy nubs of barley. Here’s the recipe. Feel free to add what ever you have. It should have some kind of potato for a really thick and creamy base with out adding actual flour or fat. Add the thyme, potatoes and roughly chopped celery. Continue to cook for 5 minutes. 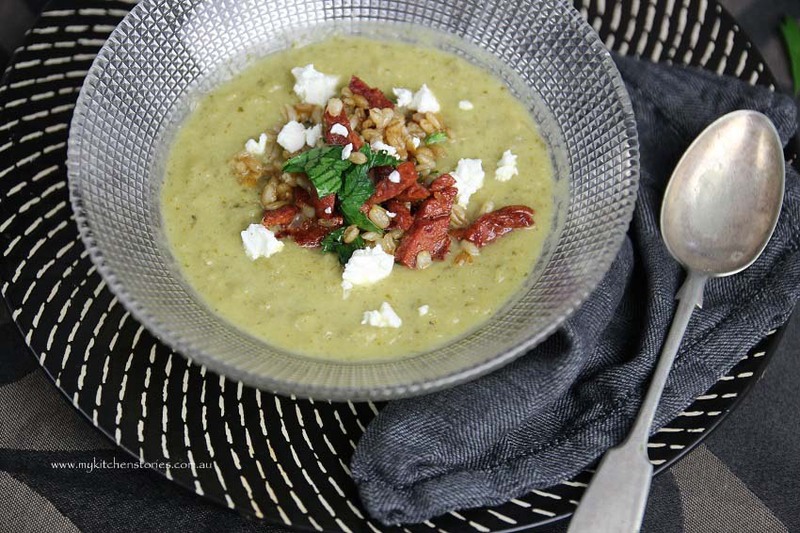 When you put soup into each of the bowls, sprinkle with the chorizo and barley and then crumble some of the feta and serve. John and I use celery with dips so we don’t have quite so many to toss out but like everyone, there’s always a limpy in the crisper. 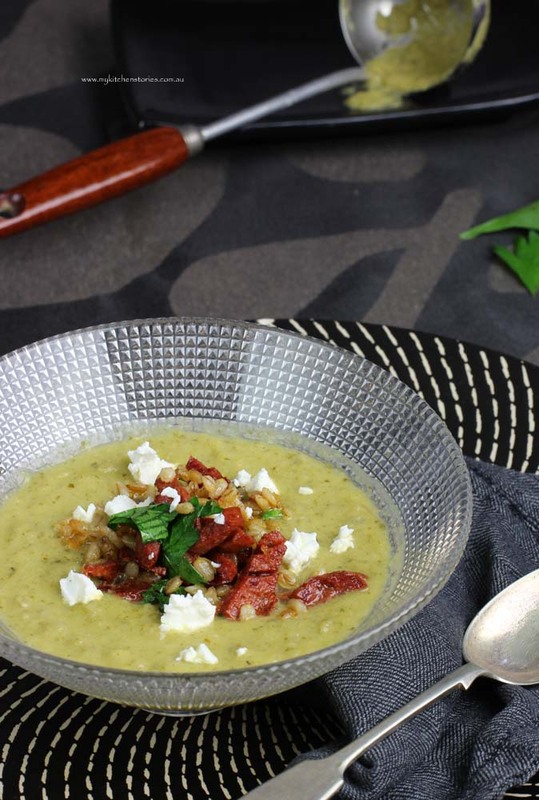 I love the topping on this soup – you genius! Every year I say I’m going to get into soup and every year winter passes and no soup. This year it must be different! Love anything that saves veges from the bin! I really like the sound of this soup. I might add the bits and pieces but I think it would be great without too! Lorraine @ Not Quite Nigella recently posted..Mad About Meringues! A Tutorial for Circus Striped Meringues & Other Sweet Styles! Celery is one of my favourite vegetables… it’s definitely under rated! Love your soup… totally yum.